In official games, five minutes are allowed for each move. In the case where there is only one possible jump available, the player has only one minute in which to make it. If the player whose move it is touches a piece that can be played, the player must move that piece or forfeit the game. If during 20 moves (10 by each player), only kings have changed position and there appear to be repeating movements, then a referee will step in to determine the winner according to who holds the strongest position. It is prohibited to annoy or distract your opponent. This includes making signs or sounds, pointing or hovering over the board with your hands or other body parts, needlessly delaying your moves, blowing smoke in your opponent's face or appearing at the table dressed in a provocative manner. 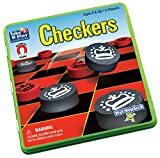 This variety of checkers is played on a 12x12 board with 30 checkers pieces given to each player. However, the rules are the same as those of International draughts. It's played on an 8x8 board and regular checkers pieces are not allowed to capture kings. Like Italian checkers and kings can make jumps to any square along a diagonal which contains only one opposing piece. The opposing piece doesn't need to be adjacent to the king, and the ending square of the move doesn't need to be adjacent to the captured piece. 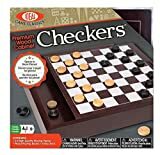 Like Spanish checkers but men can jump backwards as well. Like German checkers but played on an 10x10 board. The pieces move and jump not diagonally but orthogonally. Kings move as rooks do in Chess as well as making captures by the long jump. Men and kings can move diagonally and orthogonally. The winner is the player who loses all of his or her pieces first. Or the player who run out of any legal moves. Kings can also move orthogonally. This site is dedicated to promote exciting board games. Through extensive research, we bring everything you need to know about board games. Our mission is to produce engaging articles like reviews, tips and tricks, game rules, strategies, etc. Please enjoy. © 2018 Ultra BoardGames. All rights reserved.